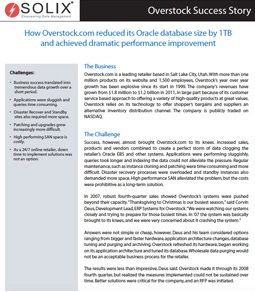 Overstock.com is a leading retailer based in Salt Lake City, Utah. With more than one million products on its website and 1,500 employees, Overstock’s year over year growth has been explosive since its start in 1999. The company’s revenues have grown from $1.8 million to $1.2 billion in 2011, in large part because of its customer service based approach to offering a variety of high-quality products at great values. Overstock relies on its technology to offer shopper’s bargains and suppliers an alternative inventory distribution channel. The company is publicly traded on NASDAQ.